Renew Juicery is up to something again! Yah, you know the one: The brand of Cold & Thirsty (created by Renew Juicery founder, Brooke Rewa, and her fabulous friend Katie Kaufmann) that’s shaking up Mylk into tasty textured treats and freezing our aches and dimples away in the Cryospa, the juicery that is taking LaLaLand by storm with lovely, lovely blends of fruits and veggies to sooth, jumpstart and send pulses of energy throughout our bodies from our toes up to our heads. Now, Renew Juicery is launching Renew Wellness Retreats. And the first one is up in just a couple of weeks on January 16 9am-7pm to kick off 2016 with a zing and an om. 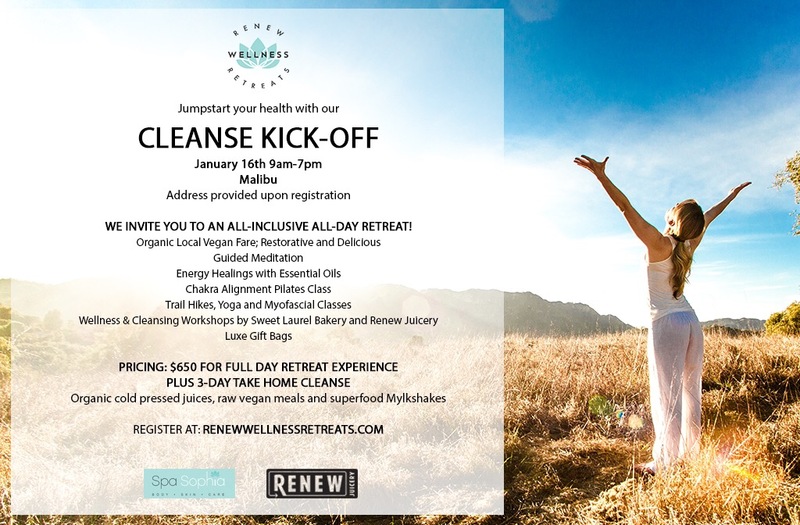 In partnership with notable wellness brands such as Spa Sophia, Sweet Laurel Bakery, Pursoma, and sister company, Renew Juicery will offer wellness seekers a day of detox, relaxation and indulgence at none other than a sprawling ocean-side Malibu estate. Can you get any better than that? We think not! Imagine a day of soothing ocean side hikes, guided meditation and chakra opening Pilates, detoxifying spa treatments, and a host of wellness workshops, with 3 organic, locally sourced vegan meals interspersed throughout your day. You’ll even leave with a 3-day cleanse and luxe gift bag. We’ve got to say, “Yes!” How about you?